Anyone who does not have some hesitation about wandering into the unknown, even if it is the legal unknown, is a fool. As Mark Twain implies, even the hero experiences fear. To be the hero in your own life and come back from the threshold of financial devastation you have to resist the fear created by “fairy tales” about bankruptcy and wander into to the dark forest to find the truth. The truth about bankruptcy, as in fairy tales, can wake the sleeping princess, open the magic door or in your case, give you a financial fresh start. Here are the five most common fears voiced about bankruptcy before the “hero” wanders into the forest. 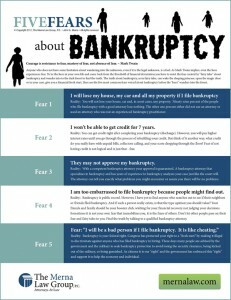 Fear 1: I will lose my house, my car and all my property if I file bankruptcy. Reality: You will not lose your house, car and, in most cases, any property. Ninety-nine percent of the people who file bankruptcy with a good attorney lose nothing. The other one percent either did not use an attorney or used an attorney who was not an experienced bankruptcy practitioner. Fear 2: I won’t be able to get credit for 7 years. Reality: You can get credit right after completing your bankruptcy (discharge). However, you will pay higher interest rates until you go through the process of rebuilding your credit. But think of it another way: what credit do you really have with unpaid bills, collectors calling, and your score dropping through the floor? Fear of not having credit is not logical and is just that – fear. Fear 3: They may not approve my bankruptcy. Reality: With a competent bankruptcy attorney your approval is guaranteed. A bankruptcy attorney that specializes in bankruptcy and has years of experience in bankruptcy analyzes your case just like the court will. The attorney can tell you exactly what problems you might encounter or assure you there will be no problems. Fear 4: I am too embarrassed to file bankruptcy because people might find out. Reality: Bankruptcy is public record. However, I have yet to find anyone who searches out to see if their neighbors or friends filed bankruptcy. And if such a person really exists, is that the type of opinion you should value? Your friends and family should be your booster club, wishing for your financial recovery, not judging your decisions. Sometimes it is not your own fear that immobilizes you, it is the fears of others. Don’t let other people pass on their fear and fairy tales to you. Find the truth by talking to a qualified bankruptcy attorney. Fear 5: I will be a bad person if I file bankruptcy. It is like cheating. Reality: Bankruptcy is your federal right. Congress has protected your right to a “fresh start” by making it illegal to discriminate against anyone who has filed bankruptcy in hiring. These days many people are advised by the government and the military to seek bankruptcy protection to avoid losing the security clearance, being kicked out of the military, or being garnished. As citizens it is our “right” and the government has embraced this “right” and support it to help the economy and individual. CONSIDERING BANKRUPTCY? GIVE US A CALL OR SCHEDULE A FREE CONSULTATION ONLINE BY CLICKING HERE.